Social organization and behaviors of Asian elephants are heavily influenced by olfactory and tactile input. The long-term studies on chemical and mechanical repellents to reduce negative elephant/human interactions began with the captive North American elephant population and is continuing with several captive facilities in the United States and sites in Southeast Asia. This repellent system is designed to affect two sensory systems – olfactory and tactile/mechanical – to influence elephant behavior. Observations are conducted before and after pheromone-enhanced mechanical devices are placed as intervention systems either in captive situations or in range states. From remote observational stands all behaviors of focal captive elephants in enclosures or raiding ones in fields of ripe crops in range countries are recorded using a high resolution night-time video recording system which will be able to record detailed nocturnal behaviors. 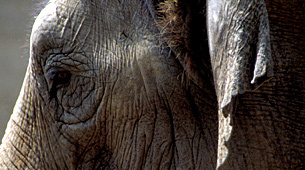 This video recording system extends the range and quality of recording, improving researchers ability to see exactly how elephants behave and react to the device, recording definitive identities and durations of behaviors leading to a clearer understanding of elephant behavior in general and crop-raiding behavior in particular. The video record will then be translated onto an extensive ethogram spreadsheet which will aid in developing improved models of the mechanical devices supplemented with newly tested aversive taste or smell-based natural products to make the system even more effective and long-lasting. Improved systems of deterrency, repellency and containment are important to the conservation of the elephant in their native habitats.